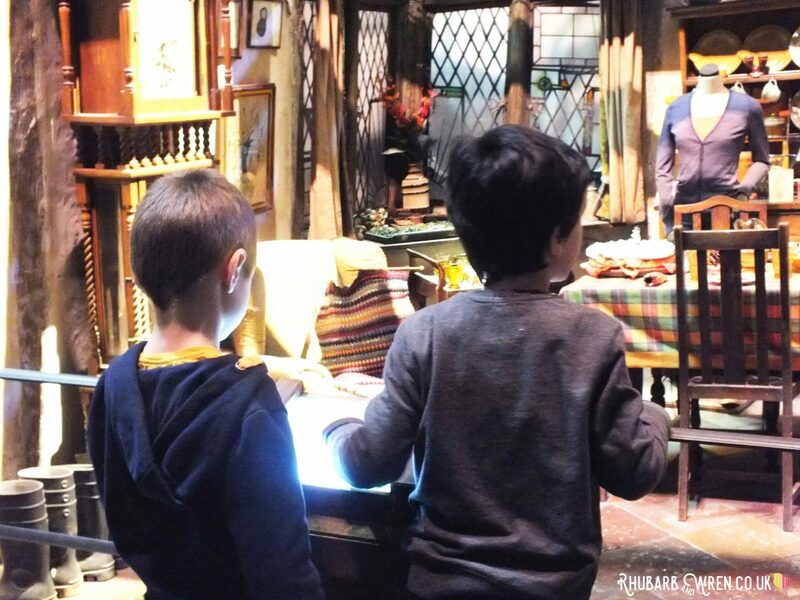 Top Tips for visiting the Harry Potter studio tour with kids! 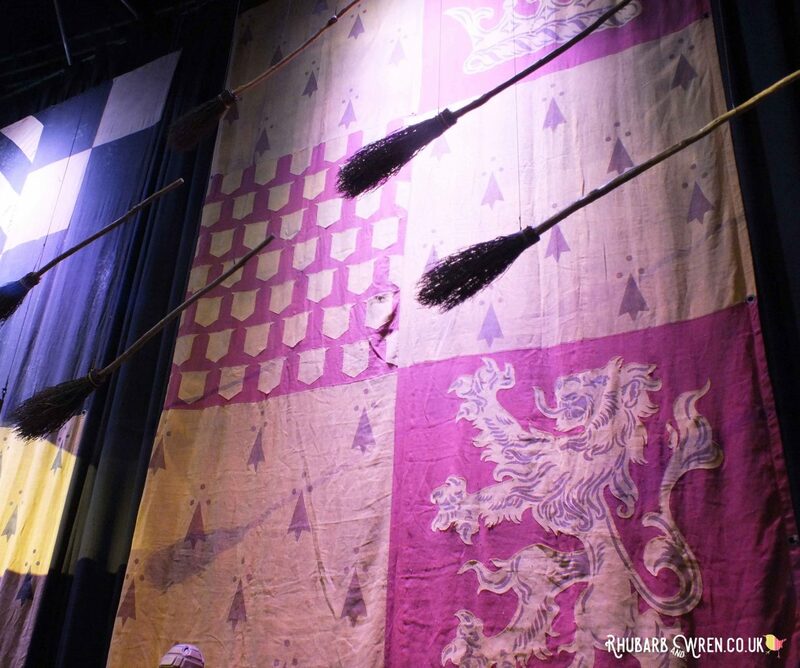 Broomsticks flying high at the magical Making of Harry Potter studio tour. Tip Number One… Kids under seven?? Think carefully before taking them! I’ve no doubt that there are many under-sevens who will love this place. I’m equally sure that it would the seventh circle of hell for/with others. There is A LOT of walking around. We were there for just over SIX HOURS, and most of that was walking. There is a fair amount of queuing as well (see tip two!). It was relatively quiet when we went (I was told by staff – it felt pretty busy to me!) but there was still nearly an hour of queuing just to get into the building and to start the tour. 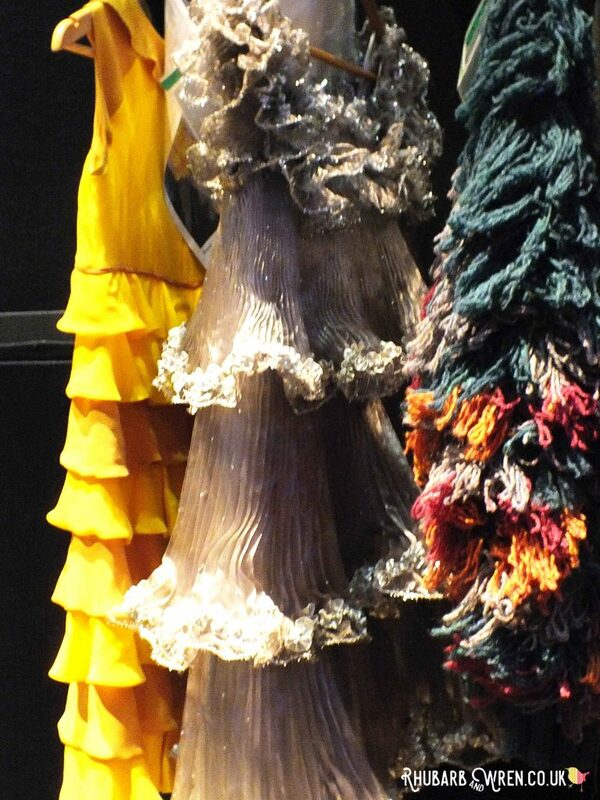 The Harry Potter studio tour is an exhibition of props, costumes and sets, not a theme park. There are a few interactive bits, but they wouldn’t have been enough to keep my three-year-old happy (and some of them involved LOTS more queuing and TONS more money). If your kids don’t like looking at things in museums and galleries for any length of time, or cope well with big crowds, they may not be impressed with this. They really need to have seen the first two or three films at least to get anything out of this, and a lot of the stuff is obviously from the later films. If it’s an issue, then be aware that toilet facilities are limited (I’d say just about adequate) inside the tour. There’s a toilet block in the car park (by the bus stop), and a bigger set of loos in the lobby, but in the first section of the tour (up to and including the cafe and backlot), I saw only one small set of toilets at the Harry Potter studio tour – and as there were just four cubicles in that particular Ladies, there was, unsurprisingly, always a queue during our visit. Each set is lovingly dressed with familiar objects. The baby facilities I saw were a fold-down changing table in the disabled loo and a baby feeding area (with changing tables) at the Backlot Cafe, which is approximately half way around. You can take a pram in (or leave it free of charge in the cloakroom), but it would not be fun with those crowds. There are lots of benches at various points during the tour for resting on, and there are no stairs (there are ramps) so everywhere has been made wheelchair/buggy accessible. The only exception I can think of is the Hogwarts Express, which has one carriage you can go into via a short flight of steps, and means walking down a very narrow passage inside. kids four and under get in free – we got a ticket for (three-year-old) T-Bird when we booked, just in case we ended up wanting to take her with us. We didn’t use it, but it didn’t cost us anything either. You can’t buy tickets at the door, and dates book up very early on. It can be a bit of a schlep to get to the Harry Potter studio tour, and the last thing you want is to have to turn around and go home again.On a side note, I paid the postage to get our tickets sent to us and was very glad I did. You can pick up your tickets from ticket machines and a box office outside, but there were queues for these… and then you have to queue again to go into the building as they do a full bag search/metal detector security check before you’re allowed inside (and everything – cafe, shop, tour – is inside, though there is a small building out by the bus stop with toilets for the desperate). You then have to queue if you want/need coffee for the grown ups in the group, and queue in the lobby area to enter the actual tour. And let’s not forget the queue for the shuttle bus from Watford Junction. ​One less queue in the freezing cold of an English January morning, only a day after it snowed (a bit) with two antsy seven-year-olds in tow was definitely worth that £3.95 postage (£6.95 for international post). Just remember you’d need to book at least a couple of weeks in advance to get the tickets posted to you in time for your visit. The amount of objects created is amazing. Beautiful graphic design is evident everywhere. Entry is in timed slots, and (avoiding spoilers!) when you go in, you’re shown a short film introduction to the tour and taken into the first set you’ll see (well, actually it’s the second set… there’s a rather iconic little set to look at as you queue for the cinematic start of the tour). After that, you’re let loose in the rest of the tour, and while you can’t go back into set one, you are otherwise free to wander through the rest of the attraction at your own pace. The creature workshop is full of wonders. 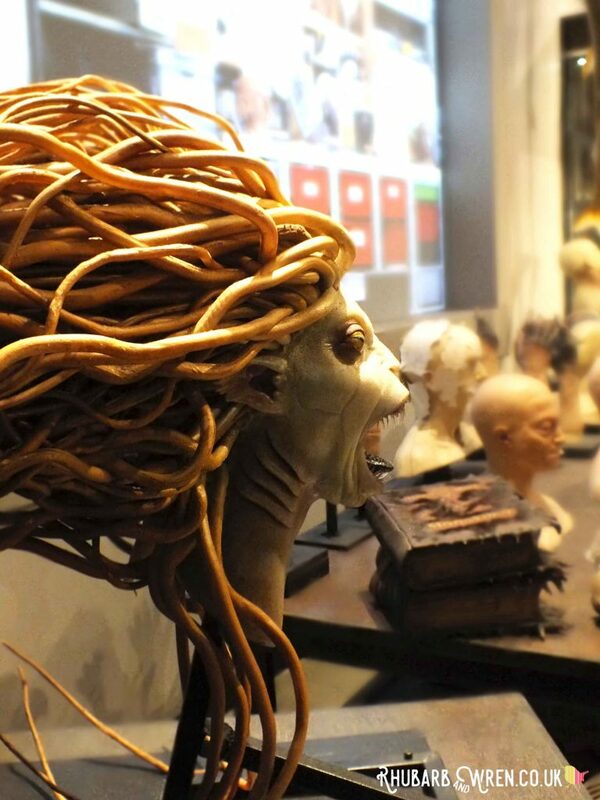 Creepy but beautiful creations abound! The Backlot Cafe and the outside area – which consists of the Backlot itself and a small picnic area. 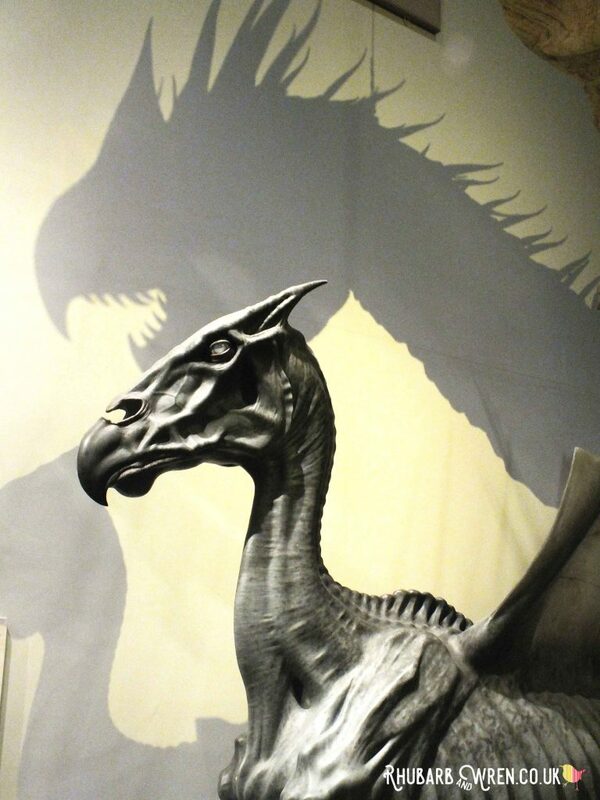 Studio K – the creature effects room, Diagon Ally, concept art and set models, and Hogwarts itself (the scale model). You can’t go back into the Backlot area and Studio J once you enter Studio K (the animatronics and special effects room), so just make sure you’re done and dusted with those areas before moving on. The final section (Studio K), felt a lot smaller and probably took us a third of the time to do (though it was definitely G-Man’s favourite bit! ), so if you’re on a tight schedule I’d suggest dividing your time accordingly. With that said, the average time spent on the Harry Potter studio tour is about 3 1/2 hours. We doubled that without even trying, so don’t underestimate how long this might take! …seeing places you always wanted to go! Lots of people dress up for the tour, and it’s great fun for most kids. G-Man however is one of those kids who, to my eternal chagrin, doesn’t much like dressing up. 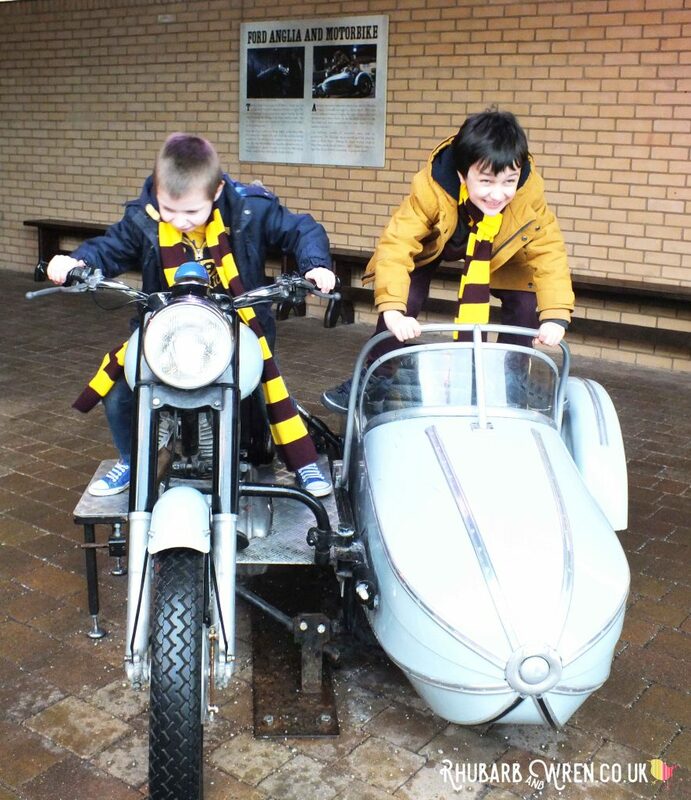 Probably just as well though, as I would happily have blown the budget and remortgaged the house to see the kiddos dressed in Hogwarts quidditch robes like these. So in the face of filial revolt, I got the kids really cheap scarves in Gryffindor colours instead (affiliate links). Wear Hogwarts scarves or full on costumes! The scarves arrived by Owl Post on the morning of our trip, along with a couple of brown paper ‘party bags’. The boys opened the scarf parcels before we left (we saved the party bags for afterwards) and proudly wore their scarves most of the day, even when sweltering inside. The boys LOVED their cheapo scarves and clearly felt part of the action without feeling self-conscious; a reminder to me that a token nod (when it comes to dressing up) can be just as exciting for young kids, but crucially less pressurised. 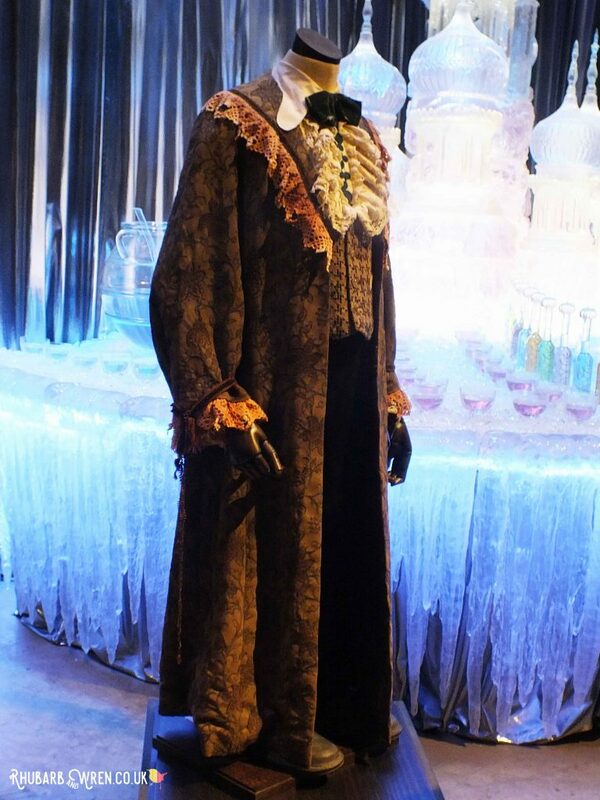 The best outfit in all the movies! Anyone fancy dressing as Snape? Tip Number Five: Decide beforehand what you’re willing to spend on, and what you’re not! This is, without a doubt, a very expensive day out. Before we had even arrived at the Harry Potter studio tour, we’d spent £150+ on tickets and travel alone (£130 on the family ticket for 2 adults/2 kids – including the postage, £10 on the tickets for the shuttle bus from Watford Junction (cash only, but they do give change), and £17-something on train fares). So given that we had spent a heap before even walking through the door, keeping further costs down to a minimum was high on my priority list!Food is normally a major part of the budget on our trips with the kids. They do like to eat! We allowed money for buying the adults’ coffees ‘cos it was very cold and very early and I NEEDED it – there’s a Starbucks coffee counter (not a proper Starbucks) in the lobby cafe. Incidentally, in the mornings the lobby cafe (the ‘Studio Cafe’ as it’s called) offers a breakfast menu that included bacon sarnies (£4.50) and porridge (£7! How much?! Why??? ), among other things. Cafe prices at both the Harry Potter studio tour Studio and Backlot Cafes were about average for a tourist attraction and there were enough kid-friendly options to feed both our guys. We thought about taking a picnic lunch but in the end, the hideousness of the idea of lugging around lunch along with our winter gear (we didn’t want to put it in the free cloakroom, as it was freezing and the backlot area is outside), outweighed the cost for us. For reference, as of Jan 2017, Kids lunch boxes (in very cool Knight Bus cardboard boxes!) were under a fiver and contained a sandwich (cheese or ham) Capri-Sun drink, a piece of fruit and a flapjack. There were also more adult sandwich, wrap and salad options, including a couple of vegetarian choices and some pots of crudites and humous. Pretty standard tourist-cafe fare. Hot food started at £3.50 for soup, and there were options like mac ‘n’ cheese at £6, hot dogs or very tasty gourmet-style fish-finger hotdogs (smothered in tartar sauce – so tell ’em to hold that if the kids aren’t into toppings!) at £5.50, and burgers at £7. They don’t, for some bizarre reason, do chips. 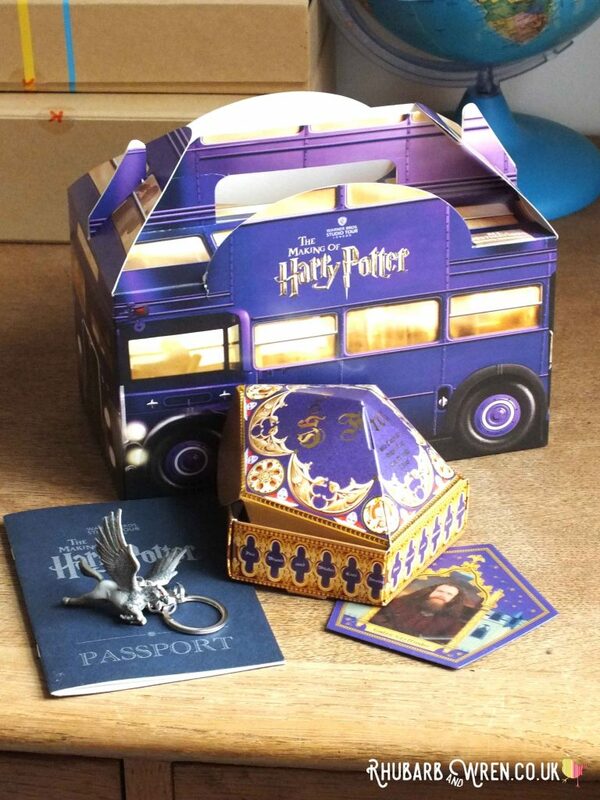 The super-cool Knight Bus kids lunch box from the Warner Bros. Harry Potter Studio Tour. Butterbeer is apparently non-negotiable when visiting the Harry Potter studio tour, and was a rather pricey £6.95 for a small cup (including the souvenir stein – it’s £2 cheaper without that). 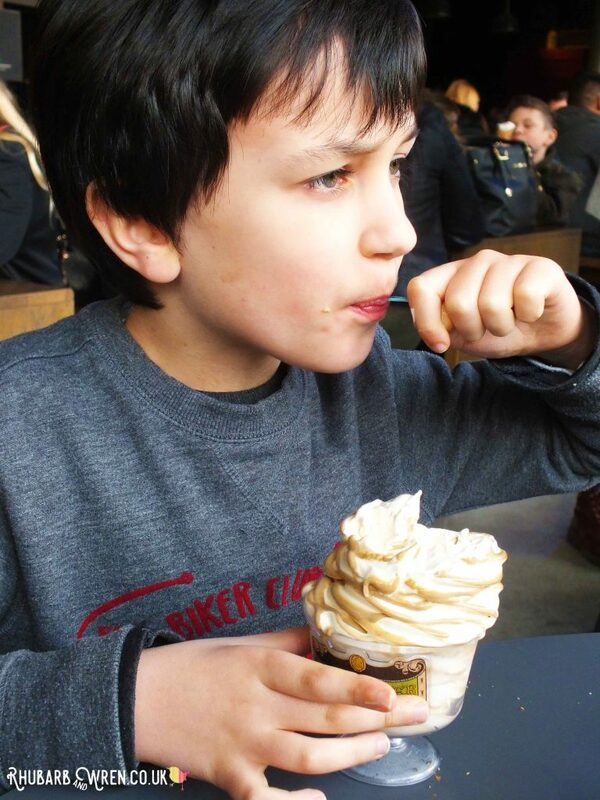 Butterbeer turns out to be cream soda with squirty UHT cream on top… who knew?! If you want something stronger, the cafe did offer a couple of grown-up choices – bottles of London Pride, Carlsberg, Bulmers and wine. As I am a soft touch, we ended up splurging on the Butterbeer ice-cream too (same price as the non-ice-cream Butterbeer!) – which is a Mister Whippy style ice-cream that was distinctly butterscotchy in taste. Portions were huge, and you can have a waffle cone at £4.95 or pay a couple of extra quid to get the souvenir ice-cream dish – just be sure to pack a bag to take it home in. The cafe food was generally very tasty, so we were happy to pay for the lunch. Less happy to pay all that dosh for the Butterbeer stuff, but I chalked that up to party-bag fillers and emotional blackmail, and tried not to cry to much into my food. 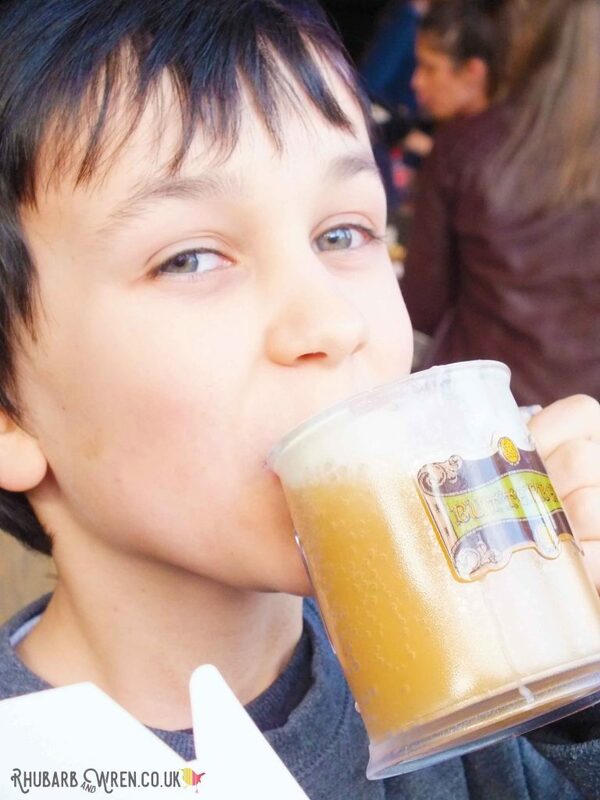 Sipping Butterbeer, just like Harry! 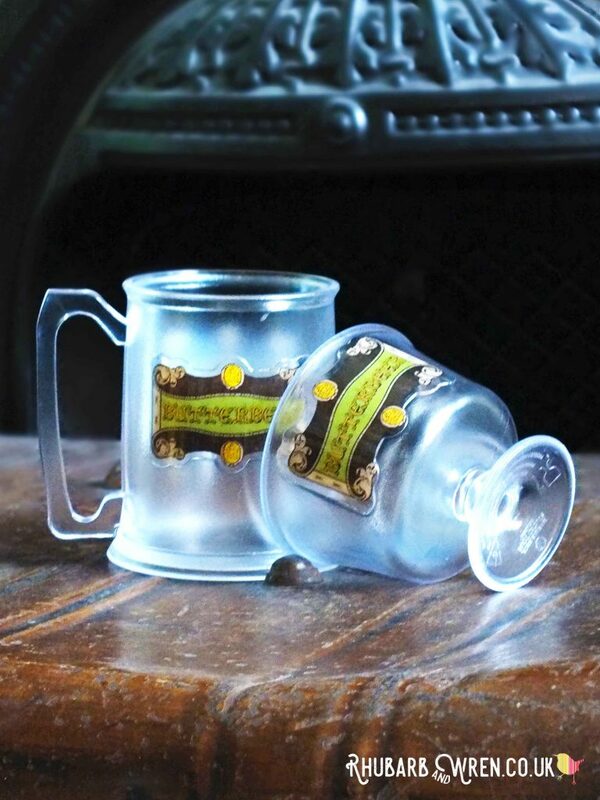 Get a souvenir stein or sundae dish when you buy Butterbeer. Other than on food and drink, your money will be magicked away from you paying for the digital guide (£4.95 per set – we didn’t bother and didn’t miss it), £9.95 for the souvenir guidebook (no thank you! ), and at the green screen photo/video ops (£14 for one photo – £7 for each one after that… DVDs and USBs were… considerably more! Yikes – No, my child, I do not love you thatmuch). And let us not forget the shops. 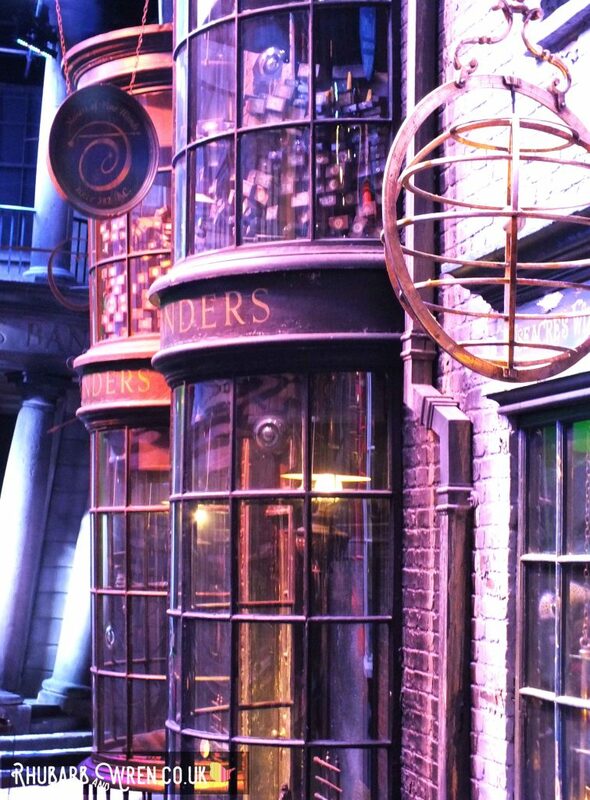 There are two – the lobby shop, and a smaller railway outlet that has different, Hogwarts Express-themed goods. Ah, those emporiums of wonder; where everything is spun out of gold and unicorn tears and handcrafted by woodland elves… or so you’d think, judging by the prices. 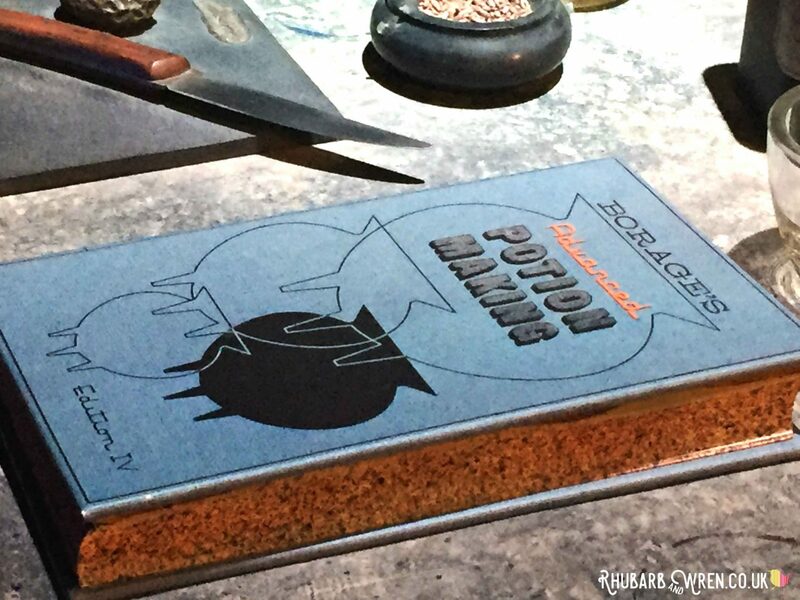 You can get a rough idea of what you’re in for by checking out the (more limited) stock available through the Harry Potter studio tour online shop. 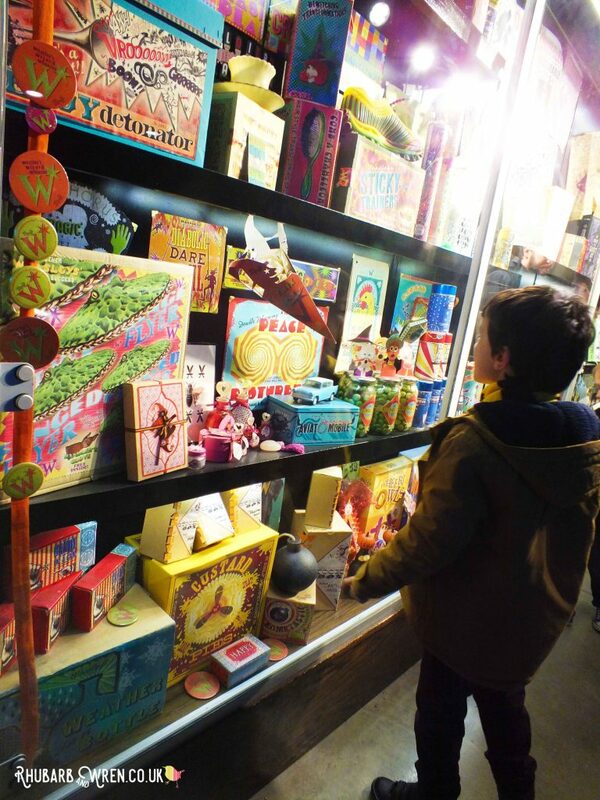 All our kids wanted were wands, Bertie Botts Every Flavour Beans and Chocolate Frogs. The wands were an eye-watering £28.95 (or a pound more for the Fantastic Beasts ones because, erm, just because), and the sweets were a gut-wrenching £8.95 each… That’s the cost for one, albeit rather large, chocolate frog or a not-very big box of not especially nice jelly beans. 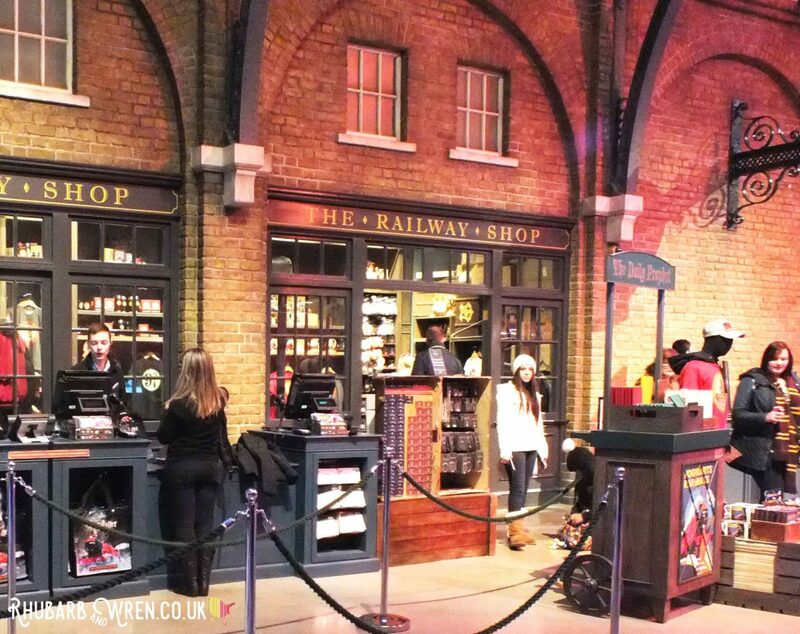 The Railway Shop is the smaller of the two stores at the Harry Potter Studio Tour. As I’d done my research, I preempted two of those requests (wands and beans) by trawling Pinterest and producing some cheap, easy and pretty convincing home-made substitutes for their party bags (you can read about them here). Both kids had brought £20 from their savings, and after a rather dispirited trudge around with me saying “nope, you can’t afford it” to every other thing, they ended up with some Honeydukes milk bottle sweets, a chocolate frog (it was their money!) and a couple of key-rings. This didn’t leave much change from their £40. Goodies from the Harry Potter Studio Tour! 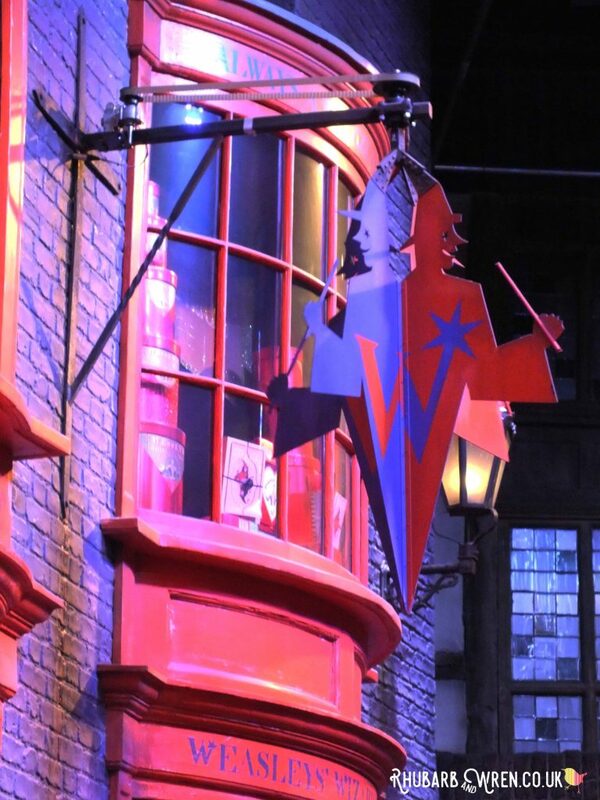 Don’t get me wrong, the shop had some lovely items, and some great packaging – especially the Weasleys’ Wizard Wheeze toys and the clothes. If you are prepared to spend a whole wad of dosh, you can do some fun shopping here – but I strongly suggest you take a little time to check out costs on things you’re tempted by beforehand or online as you shop (there’s free wifi at least!). just as an example, we had to talk G-Man out of a book he really wanted that we could see was over £5 cheaper on Amazon. 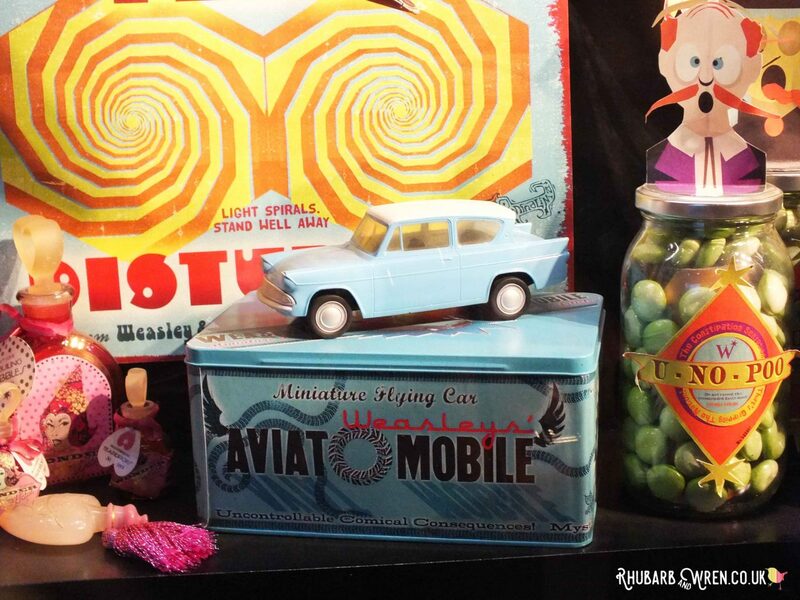 Cunningly, you can buy replicas of many of the Weasleys’ Wizard Wheezes when you reach the shop at the Warner Bros. Making of Harry Potter Studio Tour, UK. Tip Number Six: Take advantage of the free stuff! Yes, there are some free things! 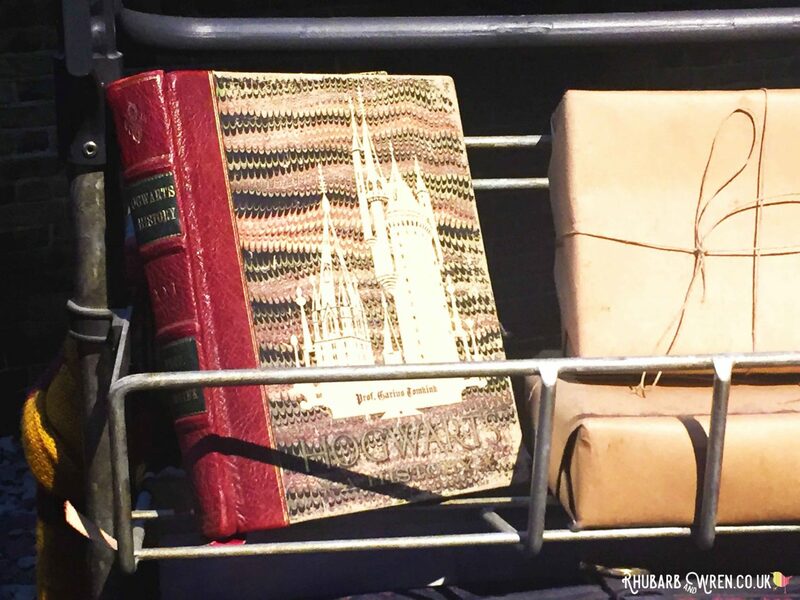 Most notably the free Harry Potter studio tour Passports that you can pick up for the kids in the lobby – guides were giving them out or you can ask for them from the information desk. 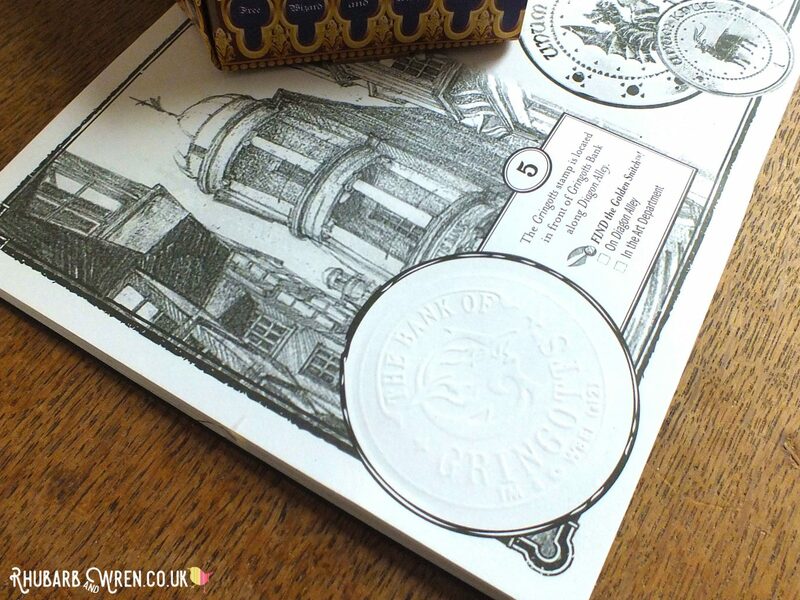 They’re a great little souvenir with spaces for six embossed stamps that the kids will find on their way around the tour. There are also clues for finding the golden snitches that are hidden throughout, and a couple of pages with puzzles and questions. 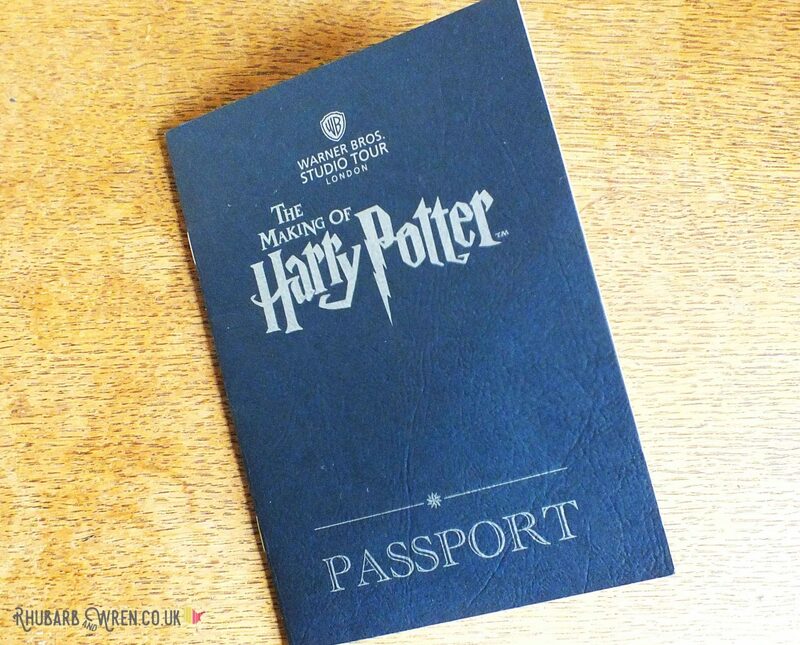 Pick up a free Harry Potter Passport for the kids! Look out for all six stamps for your passport! 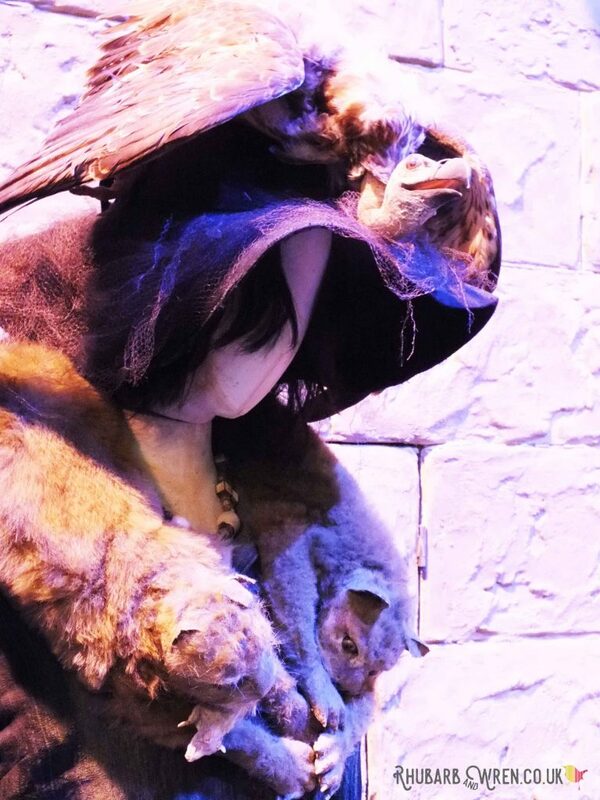 There is also a free wand duelling class that the kids can do next to the Ministry of Magic display (don’t forget to look up around there, by the way, as a lot of the massive Ministry sculptures – and Tom Riddle Snr’s grave – have been placed high up, above the crowds). Lots of fun, and you’re welcome to take photos/videos yourself for this one. The Platform 9 3/4 display at the Harry Potter studio tour has a fun ‘guess who’s luggage?’ game at the top end, where you go in. The boys found this hilarious for some reason! And take advantage of the guides. Rather than spending on hiring the digital guides, just get these guys talking and they will bend your ear back with some fascinating titbits and wonderful enthusiasm for the subject. And, they’re free. One of the things we learnt, for example, was that Newt Scamander’s wand (there was a very small Fantastic Beasts display in the lobby) is the only one that doesn’t have an animal-artefact core, because he’s effectively a vegan! It’s not always obvious, but some of the displays (especially in the creature effects room) at the Harry Potter studio tour can be set in motion with either buttons or interactive boards. Probably the first (we may have missed some!) 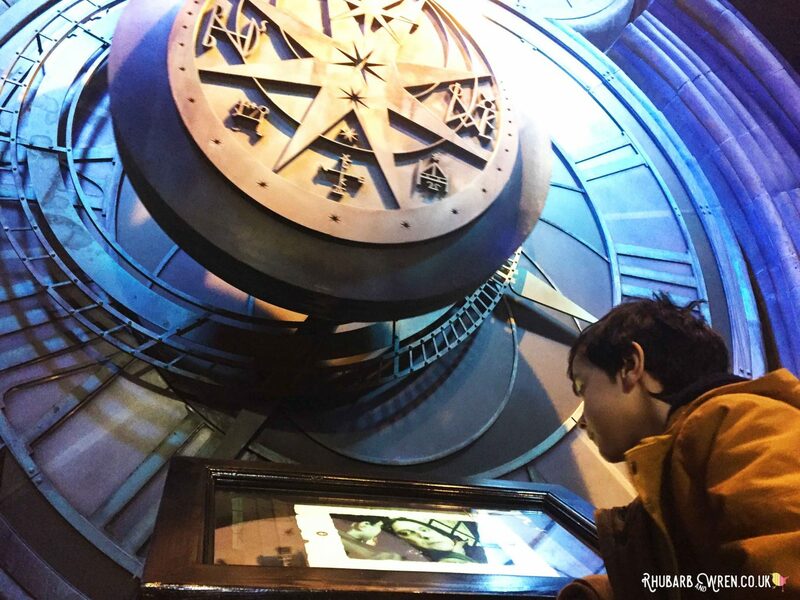 was right near the start of the tour, underneath the giant pendulum from The Prisoner of Azkaban are a row of touchscreen interfaces containing the Mauraders’ Map. Our kids loved this and spent ages exploring the different links. 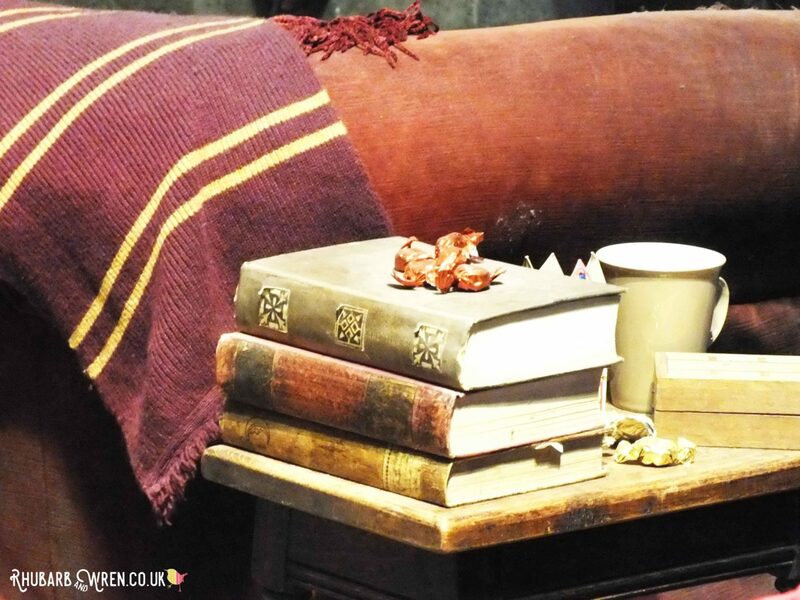 The Burrows set display has a number of little screens in front of it – each of these sets a different one of Mrs Weasley’s household Magiks into action. G-Man spent quite a while here, doing the ironing. Many of displays in the creatures room have little buttons to start up the animatronics – we were particularly taken with the Mandrake plant and the Beastly Book of Beasts! Round the corner from this, Buckbeak comes to life during a fun video by the creature effect team (and Warwick Davis), and both Diagon Ally and the Hogwarts model are on a Night-to-Day lighting cycle that’s worth sticking around for. And outside in the Backlot, the kids can clamber all over Mr Weasley’s Ford Anglia and Hagrid’s motorbike, as well as the back of the Knight Bus – lots of free photo ops here! 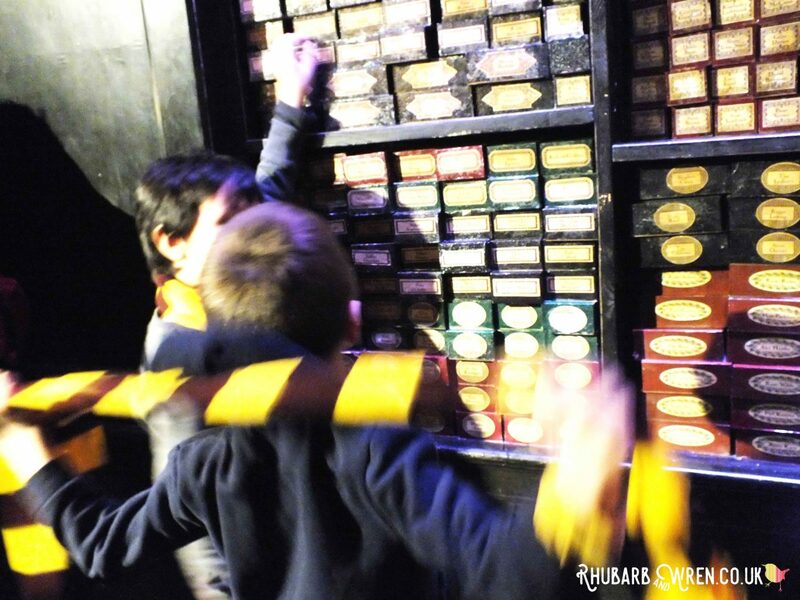 The Harry Potter studio tour is all about the wizardry that went into making the films, and so to truly appreciate everything, watch them again! But don’t stress if you can’t find the nineteen hours and forty-six minutes that you’ll need to watch all eight movies before you go… We completely failed in this but had a great time watching some of them straight afterwards instead – completely blowing G-Man’s mind when he realised he’d been standing in Dumbledore’s actual in-the-film office that very day!Parenting job – done. Watching the ‘sunrise’ over Hogwarts. So was it all worth it?YES! 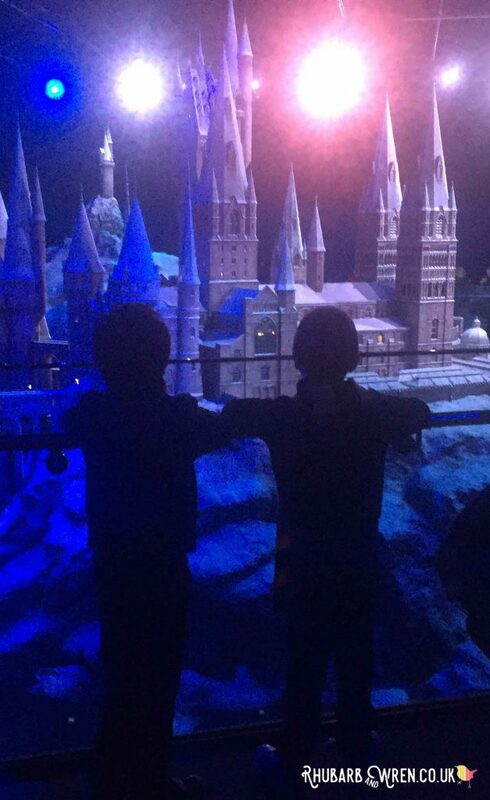 As a demonstration of the artistry involved behind the scenes, the Harry Potter studio tour experience truly is wonderful, so I have to recommend it whole-heartedly. But it doesn’t look like this exhibition will be going anywhere soon, so I really would wait until your kids have seen at least half the films and are old enough to get the most out of this style of attraction – it’s too expensive an experience to waste. On the other hand, the Harry Potter studio tour also an experience that just keeps getting pricer. As I had looked at getting tickets closer to G-Man’s actual birthday in December (2016), I happened to notice the price rise introduced as of January 2017 – for example, the family ticket went up by £20 from £106 in 2016 to £126 now. A quick look around the internet shows that generally all prices at the attraction have gone up a lot over the last few years (a family ticket was £83 in 2012. Butterbeer started out at around £2.95 a glass; now, you’re paying a few pence shy of seven pounds. The issue on prices does leave a nasty taste in my mouth, but they’re hardly the only attraction to be milking their customers for every pound. Just go with your eyes open and your hand firmly on your purse! *2018 EDIT* 2018 prices for the Harry Potter studio tour can be found here – and yes, they have gone up again! A family ticket is now £132, so not quite as steep an increase as last year, but significant, nonetheless. On the plus side, there is now a family saver ticket that is £124 (so actually £2 cheaper than last year) if you can book tickets for the selected dates that these are reserved for. 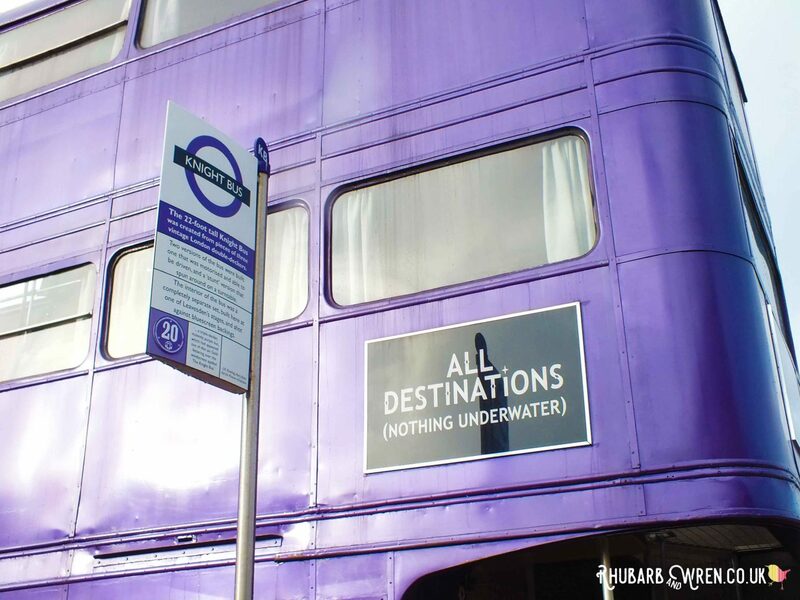 The shuttle bus from Watford Junction station to the Harry Potter studio tour in nearby Leavesdon (just outside London) is still £2.50 return (cash only). 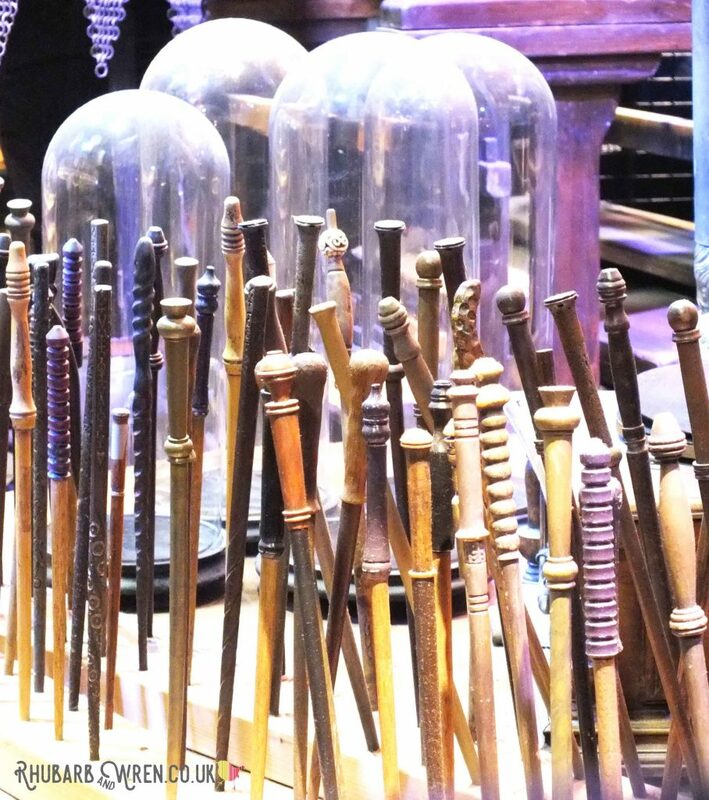 Shop prices have also snuck up slightly – wands, for example are now £29 (or £30 for Fantastic Beasts ones – again, I have no idea why these are more! ), so it’s likely that cafe prices have increased too. Since we visited the Harry Potter studio tour in January 2017, a new set ‘The Forbidden Forest’, has opened – this happened mid 2017 so possibly more will change this year too! Definitely a reason for a return visit… just need to save me some pennies. Scratch that, make it pounds! Got a thirst for all things Potter? 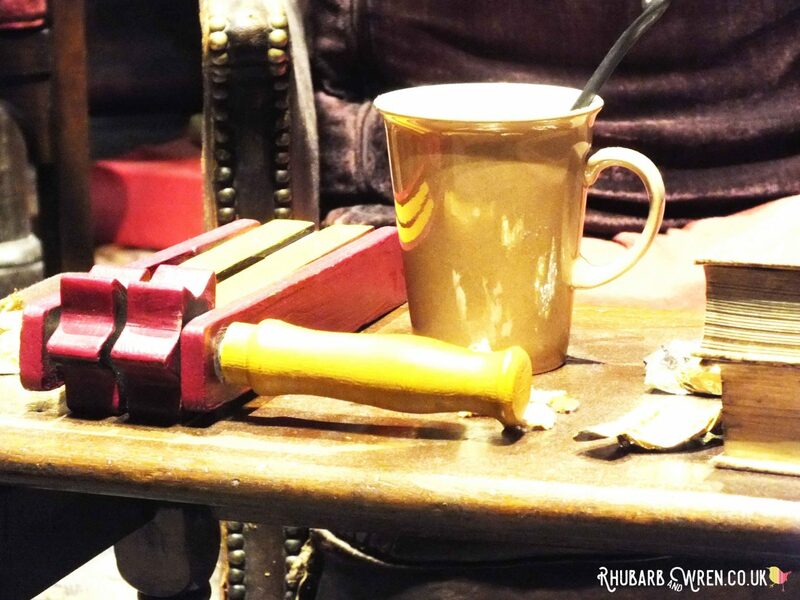 Check out these other Harry Potter-related posts! 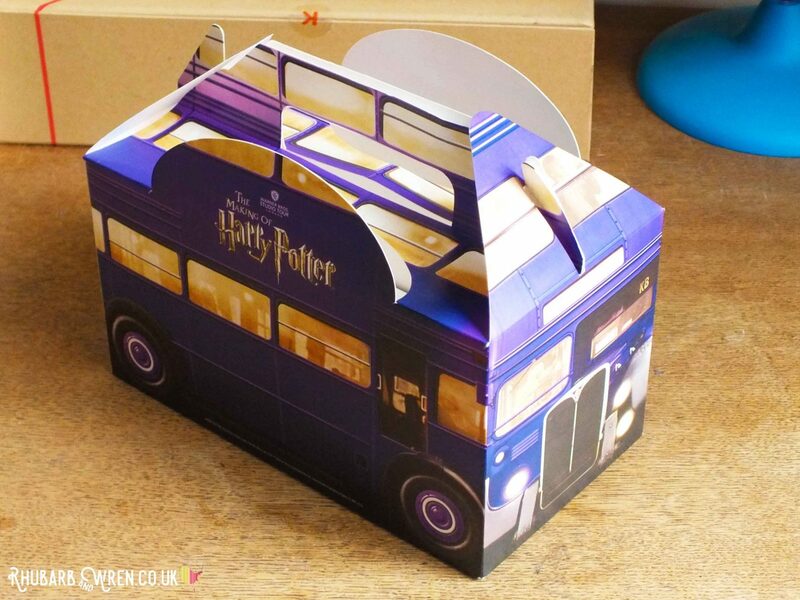 Make your own Hogwarts inspired goodies for Harry Potter party bag or trip to the Studio Tour. Fantastic tips – thank you! Thinking of taking my daughter and a couple of her best friends for her birthday in June 2019. Sounds expensive but then again I’ve spent over £300 on parties and the like over the last two years, and they can be over in two hours. It’s a great experience – definitely something they remember longer than most birthday parties, in my experience anyway!